Nail Wheel Wednesday will be around a little later today; right now I want to share a purple I wore last week. It's Estee Lauder Ultra Violet, which was part of the Summer 2010 collection. I bought it earlier this month when the salesperson looking for the Holiday 2010 polishes for me found this instead. I was happy to get it, since at the time it came out, I was pretty much completely ignoring department store brands. Ultra Violet is a deep royal purple with brighter purple almost-glitter shimmer. In low light (third photo below), the base goes almost black and the shimmer really pops. I was quite smitten with it in all lights. I couldn't resist doing a comparison to other shimmery purples in my stash, so I pulled out some likely suspects. Left to right: Kiko 278, Estee Lauder Ultra Violet, OPI Visions of Sugarplum, Zoya Valerie. 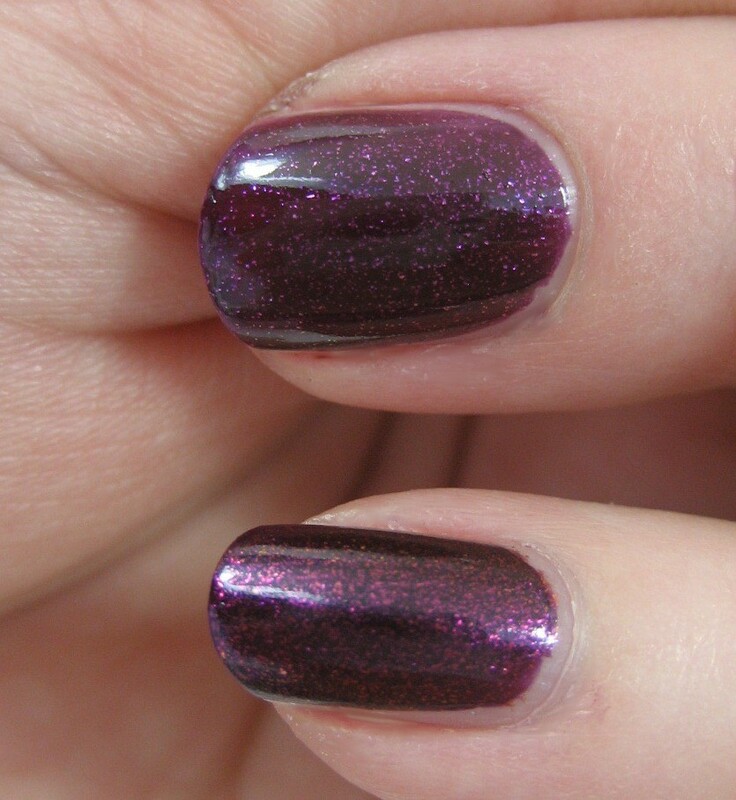 Top to bottom: Kiko 278, Estee Lauder Ultra Violet, OPI Visions of Sugarplum, Zoya Valerie. The Kiko, pretty and purple though it may be, is obviously not even close to duping Ultra Violet. It was the only of of these that took three coats instead of two, probably because its base color is lighter. 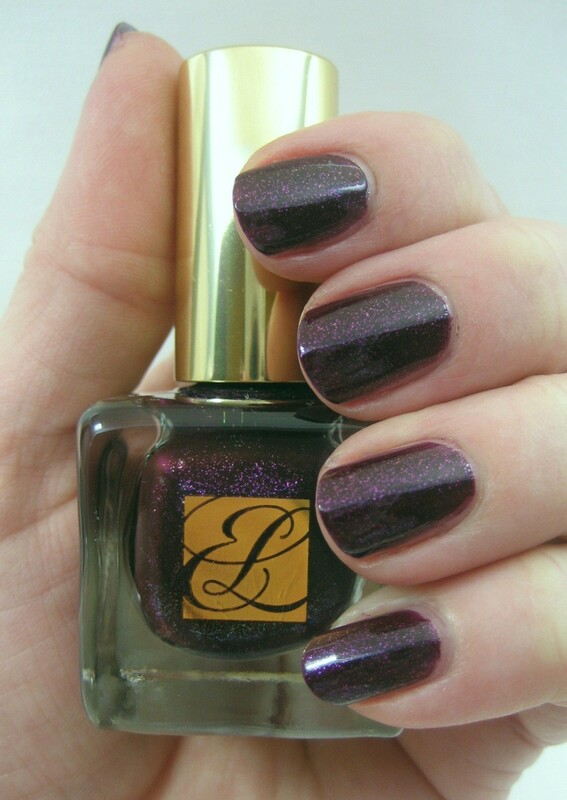 Visions of Sugarplum is definitely cooler-toned than Ultra Violet. 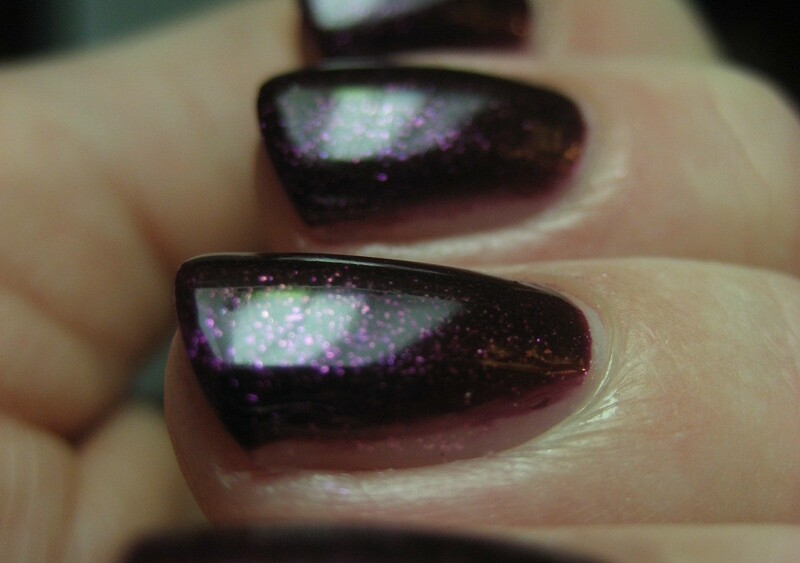 Valerie comes closest, though its shimmer seems more dense, with less of the base color showing. In some lights, though, it looks really similar. I did my best hand contortionist impression to get pictures of my middle finger with Ultra Violet next to my pinky with Valerie. 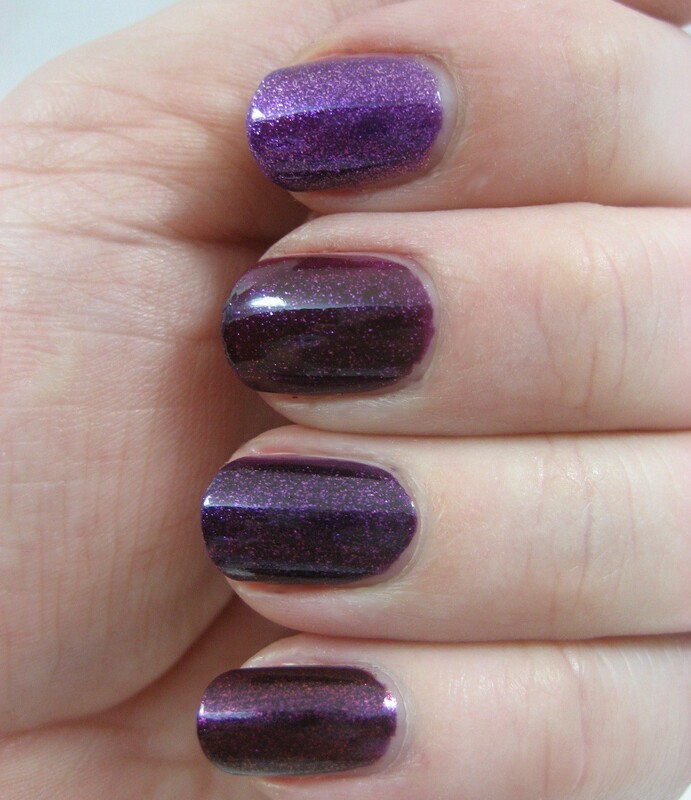 Ultra Violet (top), Zoya Valerie (bottom), in bright light. Ultra Violet (top), Zoya Valerie (bottom), under indirect light. I really, really like Ultra Violet, but at $18 for .3 ounces, it's definitely a splurge. :) What pretty purple polishes! Great comparison! I don't own any EL polishes, but this one is calling my name! SO pretty! is it similar to orly's galaxy girl? so beautiful! they are all so close but sugarplums would probably be the easiest for me to buy. I feel like Estee Lauder makes nice polishes and I love their bottles, but the price for the amount of product is just too too much. Thanks for the great comparison too! I remember seeing this and wanting it, but I was put off by the price. It's so pretty though. :) I love the Estee Lauder bottles. Thanks, everyone! It is pricey, no doubt about it. I do like that they only come out with a couple new colors every season (unlike OPI tempting me with a dozen every few months). 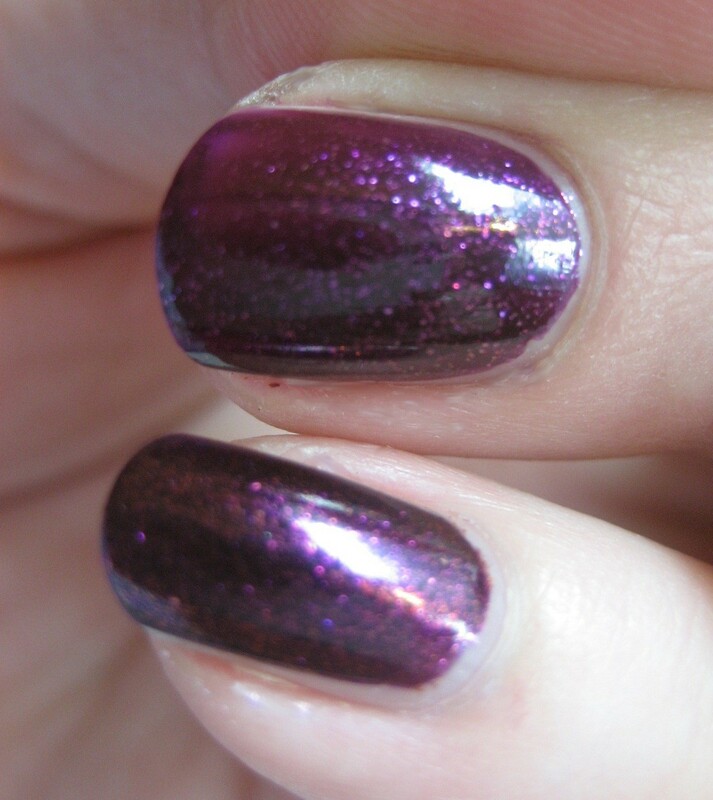 Katt, I'm not sure about Galaxy Girl; I'll add that comparison to my swatching list.